ONE// Pizzazzerie’s Colorful Easter Table. We love this gingham and stripe tablescape combo for Easter. TWO// Taste of Home’s Easter Recipes. A full list of Easter recipes for celebrating this weekend. THREE// Sasha Nicholas Tea Set. How precious is this monogrammed tea set? Perfect for Mother’s Day. FOUR// Draper James’ Dresses. Still looking for an Easter dress? FIVE// Sally’s Baking Addiction’s Cupcake Bouquet. A fun and easy dessert for Spring. Looking for an easy cocktail to serve for Easter brunch? This three ingredient cocktail is simple and festive for the holiday. Who doesn’t love the mix of chocolate and banana flavors? If you are looking for more Easter inspiration check out these posts from The Sip: Easter brunch, boozy banana pudding recipe, adult Easter basket, and Easter bar cart. In a cocktail shaker, add Jackson Morgan Southern Cream and creme de cocoa. Shake well and pour into a martini glass. Skewer two chocolate egg candies on a metal cocktail pick and place on the side of the glass as a garnish. Please sip responsibly. All images Christy Wilson Photography. You can shop this post below. I can hardly believe Easter is this weekend, it feels like Christmas was yesterday. I remember growing up my mother would sew my brother and I matching outfits for the big Easter egg hunt at church. When we were babies, the outfit included a bonnet. There is something extraordinary about those memories now as an adult. Why not host an adult Easter egg hunt? To create an adult Easter egg hunt at home, hide eggs with mini liquor bottles in them. Jackson Morgan has the cutest little bottles available in most states. As the prize, fill a basket with a full-size bottle of Jackson Morgan Southern Cream, festive napkins, fun cups, and Easter candy. The person with the most eggs wins the basket. 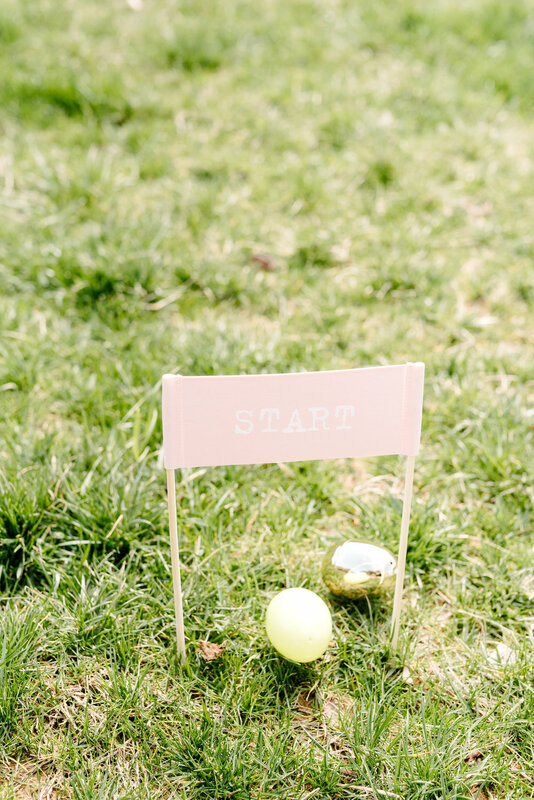 These adorable Easter egg hunt signs were a Target find and linked below. I had a hydration station with our plastic mason jar mugs from our company store just in case our egg hunt got competitive. In our family, we turn everything into a competition. All you need is a party bucket, fun straws, and themed paper napkins. All images Christy Wilson Photography. You can shop this post below. Easter baskets are not just for children. In my family, we still give each other Easter baskets from the “Easter Bunny” even though we are grown. Our dogs usually get a treat too. On the bar cart from our Easter brunch party, I included a basket of my favorite things and Easter candy for guests to enjoy. I love the idea of dropping a basket full of Easter surprises on a neighbor’s doorstep too. Here are the items we included in our basket, you can personalize and add anything from a cocktail shaker to decorated cookies depending on the recipient's tastes. I linked a few of my favorite fancy Easter candies below. Please sip responsibly. All images Christy Wilson Photography. You can shop this post below. Special thanks to Ruthie and Oliver Letterpress for partnering with us on this party. Banana pudding is a staple in the south. We serve it for birthdays, holidays, or just because. My mom came up with the idea for Jackson Morgan in the banana pudding flavor. They always say your mother is always right and she hit the nail on the head with this flavor. You can serve this dish many ways, but we preferred a layered dessert in a trifle dish growing up. Gather all of your ingredients and trifle dish. Make the instant pudding first according to the instructions on the box, but substitute 1/2 cup of Jackson Morgan Southern Cream in banana pudding for the milk. Mix the remainder of the milk with the pudding mix until a pudding consistency forms. You can add more Jackson Morgan instead of milk if you prefer for it to be boozier. Slice the fresh bananas and set aside. In a trifle bowl, layer vanilla wafers, fresh bananas, banana pudding, and whipped cream topping. Make sure you go in this order so your vanilla wafers will not be soggy, end with whipped cream topping. Place four vanilla wafers in a sealed plastic bag and use a rolling pin to crumble the cookies. Sprinkle the crushed cookies over the whipped cream topping and place a few banana chips on top as a garnish. Serve immediately. ONE// Cedar and Rush’s Easter Cocktail with Jackson Morgan. Nicole made fun chocolate bunny cocktails with Jackson Morgan Southern Cream. TWO// Nico and Lala’s Masters Golf Swag. Who is throwing a party for the Masters golf tournament? THREE// Katie Jacob’s Easter Bunny Coconut Cupcakes. These cupcakes are adorable for Easter brunch. FOUR// Sally’s Baking Addiction’s Salted Caramel Recipe. You could easily spike this recipe with Jackson Morgan Southern Cream in salted caramel. FIVE// Martha Stewart’s Bunny Napkin Fold. A unique way to display napkins for an Easter tablescape. I loved our Easter brunch party post on The Sip earlier this week. Today, I am sharing all the details about the bar cart. 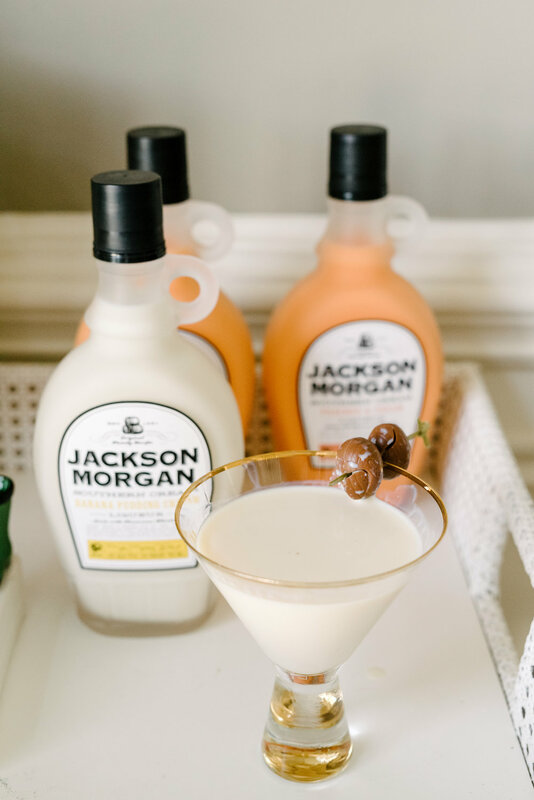 When spring arrives, I cannot wait to create cocktails with Jackson Morgan Southern Cream in peaches and cream and banana pudding flavors. In the past, I have incorporated edible flowers to garnish spring cocktails, which is a fun addition. When I first discovered this floral art print from Inslee, I knew it would look stunning over my bar cart in a gold frame. I filled a glass hurricane with metallic egg vase filler to match the tablescape. After running out of table space, I served carrot cake cupcakes on the bar cart. My trusty Nora Fleming napkin holder with the adorable rain boots mini held “Happy Easter” napkins for guests to use when creating cocktails or snacking on a cupcake. On the bottom, I put together a small floral arrangement with flowers from a local flower mart. Instead of displaying the flowers in a traditional glass vase, I used a monogrammed champagne bucket from Sasha Nicholas. My “adult” Easter basket was full of candy and treats. All images Christy Wilson Photography. You can shop this post below. Special thanks to Nora Fleming and Ruthie and Oliver Letterpress for partnering with us on this party. It is hard to believe Easter is right around the corner, we have had a few spring-like days in Tennessee, and I hope the cold weather is behind us. For the first time, I am hosting my family for Easter. I am thrilled to have the opportunity to give my Mom a break from entertaining. I plan to use this same tablescape, but hopefully move it outside if it is nice weather. After what feels like the longest winter, I was ready for a fresh color scheme. The bright green gingham paired with the brown bunny plates created a pretty color scheme. I incorporated texture with natural elements such as the seagrass chargers and moss bunnies. Pops of gold added a nice modern touch, how cute are these gold foiled bunnies?! The art over the bar cart is where the color inspiration came from, I adore this floral print by Inslee. I am a traditionalist when it comes to Easter menu planning. For our Easter brunch, we had spiral ham, scalloped potatoes, deviled eggs, asparagus tart, glazed carrots, roasted artichokes, rolls, boozy banana pudding (recipe coming to The Sip soon), and of course Jackson Morgan Southern Cream cocktails. I especially love our peaches and cream and banana pudding flavors this time of year. Although I love fresh flowers, they often die too quickly. For this table, I used speckled egg vase filler in a pretty hurricane that I can display all spring and reuse next year. I added mini moss baskets, which holds Jackson Morgan Southern Cream mini bottles perfectly for party favors. My crystal glasses dressed up the table for the occasion. I was thrilled when I found these crystal cordial glasses, which are basically a fancy shot glass to serve Jackson Morgan in for parties. Ruthie and Oliver letterpress place cards matched the napkins and table throw well. Special thanks to Nora Fleming, Ruthie and Oliver Letterpress, and Juliska for partnering with us on this party. All images Christy Wilson Photography. You can shop the post below. ONE// WSWA. Next week we will be in Orlando for WSWA. If you are there, stop by and try a sip of Jackson Morgan. TWO// Dollar Hydrangea. Hydrangeas for only $1 a stem?! Count us in! THREE// Sally’s Baking Addiction Chocolate Bread Pudding Recipe. This bread pudding recipe spiked with Jackson Morgan would be delicious for brunch. FOUR// Juliska Al Fresco Entertaining. All of these shatter proof entertaining pieces have us craving an outdoor dinner party. FIVE// Southern Living’s Hey Y’all Video Series. We recently stumbled upon Southern Living’s youtube series called Hey Y’all. So many great hosting tips and recipe ideas. Spring is in the air we could not be happier. 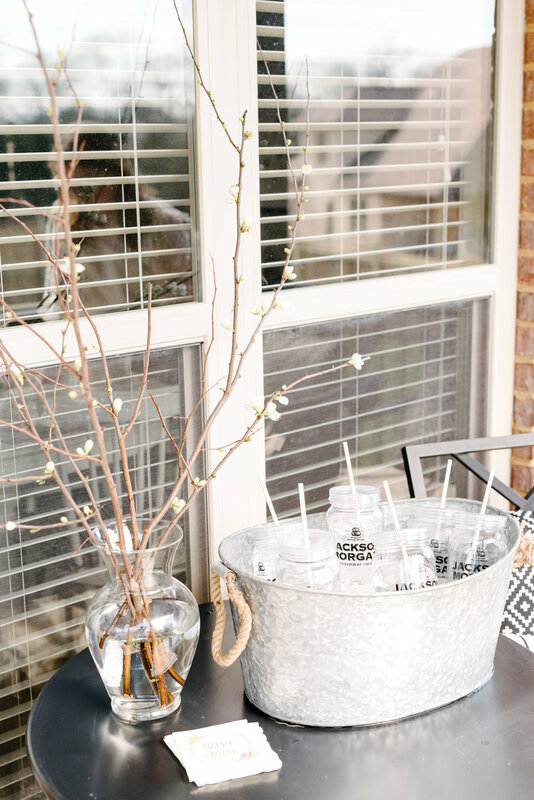 The bar cart from our spring brunch party was the perfect way to get us in the mood for a new season. My favorite way to use a bar cart is for drinks and favors. I served Jackson Morgan Southern Cream in whipped orange cream and used the 375 mL bottle as party favors, more details about the favors can be found on this blog post. There is something about citrus flavored drinks that screams spring. When decorating a bar cart, I like to incorporate the same color scheme from the tablescape. The classic blue and white color combination paired with pops of orange was a personal favorite theme for me. I used extra oranges from our orange tree, check out the DIY here, in a pretty bowl for guests to use to garnish their drinks. I found these vintage orange glasses at a local antique store in my hometown. This adorable bar sign from Ruthie and Oliver letterpress said “Orange you Delightful” and was lovely in addition to the fun print by Inslee. Do not be afraid to layer art and go bold with a large art print, it makes such a statement. I pulled up one of my well-loved Society Social bow back chairs and paired with a coordinating pillow. When hosting a party, I like to shop my home first and see if I already own any pieces that would be an excellent accessory for my table or bar cart. You can shop this post below. Special thanks to Society Social, Nora Fleming, Ruthie and Oliver Letterpress for partnering with us on this party. Please sip responsibility. All images Christy Wilson Designs. Growing up, we always would grab a slushy, milkshake, or fun drink before watching my brother play baseball. When spring comes around, a slushy or milkshake still sounds like a good idea. 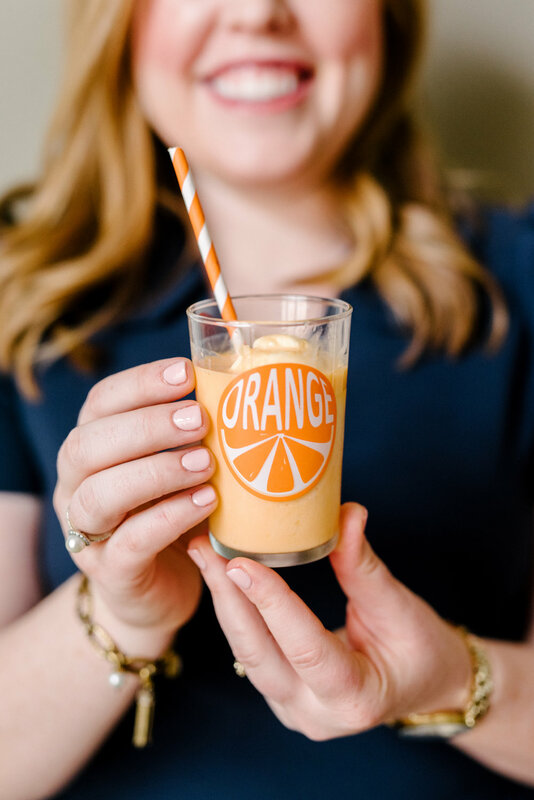 For our Spring brunch party, I wanted an adult version of everyone’s favorite orange ice cream slush. In a shallow freezer-safe dish, freeze orange juice overnight. Once the orange juice is frozen, use a fork to break up the frozen orange juice. Place 3 ounces of the frozen OJ into a glass. Next, top with a scoop or two of vanilla ice cream. Then top with Jackson Morgan Southern Cream in whipped orange. Be sure to combine in this order or your drink will curdle. Garnish with whipped cream. Enjoy immediately. ONE// Packed Party’s Drink Umbrella Set. We are craving warmer weather and festive drinks with umbrellas. 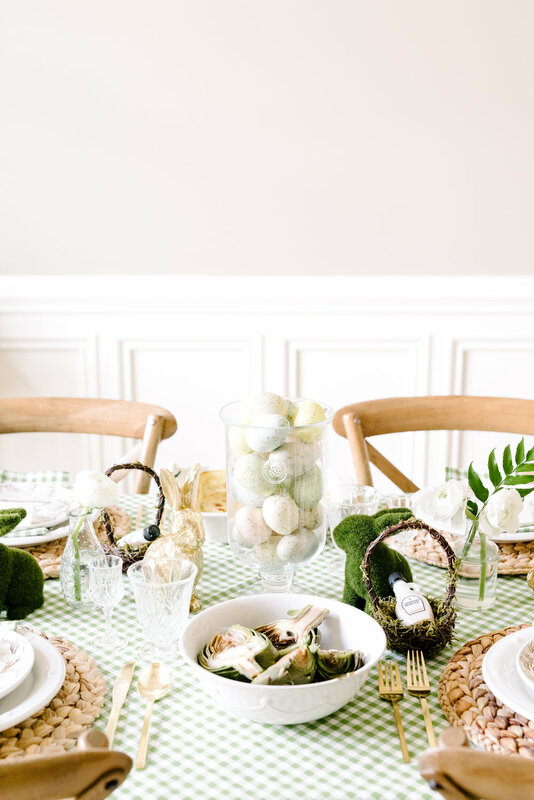 TWO// Sugar and Cloth’s Pastel Easter Table. Have you thought about how to decorate your table for Easter yet? THREE// 50 DIY Cake Stand Ideas. So many DIY cake stand ideas for upcoming celebrations. FOUR// Lemon Tree Dwelling’s Mint Martini. This cocktail would be delicious made with Jackson Morgan Southern Cream peppermint mocha. FIVE// Jackson Morgan Beach Towels. Everyone’s favorite Jackson Morgan striped beach towels are back, order one for your summer adventures. Party favors are an easy way to make any party feel more elevated. 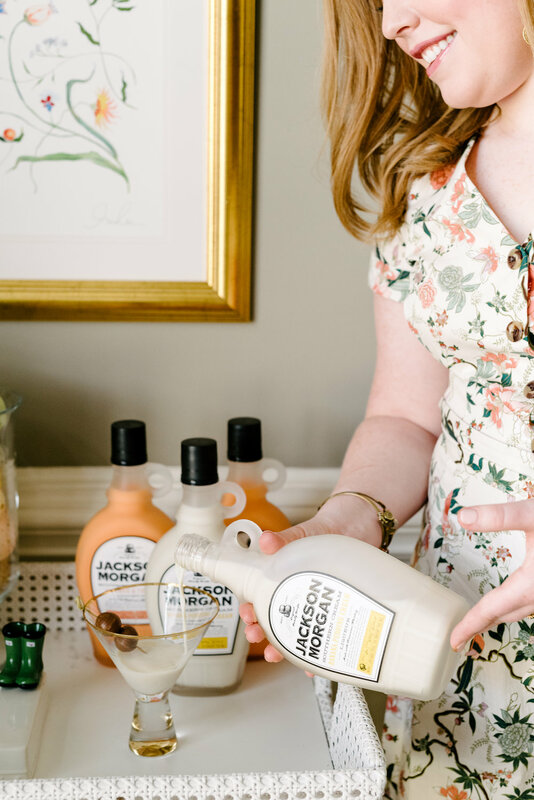 Jackson Morgan Southern Cream has a line of 375 mL bottles that are available in most markets. These bottles are larger than our mini bottles, but not quite as big as our standard 750 mL size. For our Spring brunch, these bottles in whipped orange were perfect for gifting as party favors. I always keep gift tags on hand and love Dixie Design’s expansive collection. They also have invitations wrapping paper, stickers, and other stationary needs that match. The blue and white crest gift tags I used can be found here. I also linked a few of my favorites below. During the holidays, I usually stock up when stationery companies have sales. You may remember the red and pink gift tags I used for our Valentine’s Day soirée. For the party favors for the Spring brunch party, I just tied orange paper straws to our Jackson Morgan Southern Cream 375 mL bottle with a gift tag. I used white pom pom wired ribbon, but you could use any ribbon you own. These party favors could not be easier to put together. What are your go-to party favors to gift? Christy Wilson Photography. You can shop this post below. ONE// Hester and Cook’s Easter Shop. So many pretty papers for Spring and Easter hosting. TWO// Draper James “What Would Dolly Do?” Shirt. These fun shirts are finally back in stock. THREE// Delish’s 14 Iced Coffee Hacks. Several recipe ideas for iced coffee, add Jackson Morgan Southern Cream for a boozy treat. FOUR// William-Sonoma’s Easter Shop. Festive tabletop pieces for Spring and Easter entertaining. FIVE// Lettermade’s Party Animal Linen Napkin Set. These napkins would be a conversation starter. St. Patrick’s Day is this weekend. Who has time to plan elaborate cocktails to celebrate? This easy cocktail is festive and fun for the holiday. You can add Tennessee whiskey or vodka for a stronger drink. In a festive glass, pour in Jackson Morgan Southern Cream in peaches in cream. Using a cocktail pick, skewer rainbow candy. Place skewer on top of glass. Chocolate and orange are such delicious flavors when combined. For our spring brunch, I served boozy orange chocolate scones. You can also substitute cranberries for chocolate if you prefer a fruity scone. These decadent scones served with a glass of Jackson Morgan Southern Cream in whipped orange is a tasty happy hour treat. Preheat the oven to 425 degrees. In a large bowl, mix together dry ingredients (Flour, Baking Powder, and Salt) excluding the extra sugar for sprinkling. Using a cheese grater, grate the frozen butter. Slowly mix in the grated frozen butter into the bowl with the dry ingredients If you prefer, you can use a pastry cutter with cold butter instead of frozen. Add in the chocolate chunks and orange zest. Next, add the heavy cream (excluding the 2 tablespoons for brushing) and Jackson Morgan Southern Cream to the mixture. Stir slowly and be careful not to over mix. After combined, place dough on a floured pastry mat. Knead a few times with floured hands until a dough ball forms. Next, using hands form into an 8-inch circle. Cut pie shaped triangles out of the circle. Place triangles on a baking sheet lined with parchment paper. Put pan with scones in the freezer for 30 minutes to allow the scones to rest before baking. After 30 minutes, remove from freezer, using a pastry brush, brush the scones with heavy cream and sprinkle with course sugar. Bake for 12 minutes or until golden. While waiting for the scones to cool, make the glaze. Combine powdered sugar and orange juice until you have a thick glaze, if not thick enough you can add more sugar. Once scones are cooled, drizzle glaze on top of the scones and enjoy! Recipe Slightly Adapted from Elisabeth and Butter. Christy Wilson Photography. ONE// Juliska’s Spring Linens. Pretty linens for Spring and Summer hosting, can we have a set of each pretty please? TWO// Sally’s Baking Addiction’s Crumb Cake Donuts. This donut recipe with a mug of spiked coffee sounds delicious for brunch this weekend. THREE// Country Living’s 15 DIY St. Patrick’s Day Decorations. Easy and fun DIY decorations for St. Patrick’s Day. FOUR// Inspired by Charm’s Leprechaun Martini. Sub Jackson Morgan Southern Cream in this martini for a tasty cocktail. FIVE// Happy Everything’s Rainbow Attachment. A festive attachment for St. Patrick’s Day parties. Did you catch our Spring orange brunch on The Sip earlier this week? The centerpiece for this party is an easy DIY that adds a lot of personality to your table. All you need are a few supplies from your local craft store and oranges. Step 1// Gather your supplies. Start with your desired vase you want to use for your centerpiece. I found this blue and white vase at a local interior design shop. Purchase a styrofoam cone and discs that fit into the vase. I took my vase with me to the craft store to ensure a perfect fit. Step 2// Place styrofoam discs inside the vase. Place toothpicks in the discs then top with the styrofoam cone and make sure it is sturdy since the oranges will add extra weight. You could also use hot glue to keep the discs and cone together. Step 3// Beginning at the bottom of the cone use toothpicks at an angle to place oranges around the styrofoam cone. I staggered the oranges to try to cover the majority of the styrofoam. Poke one end of the toothpick into the styrofoam cone, then the other into the orange. Make sure the oranges all face the same direction and are similar sizes. Step 4// Go back and ensure there are no large holes showing where you could add another orange and move oranges around until you have your desired look. Then using straight pins, pin the extra orange leaves in the empty places on the cone where the oranges do not cover the styrofoam.